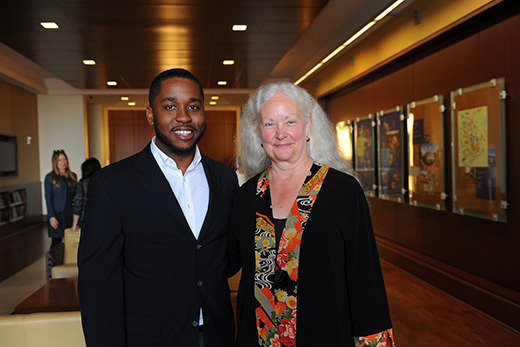 Osric Forrest, who received his PhD during Emory’s May 14 Commencement, and Patricia Bauer, Asa Griggs Candler Professor of Psychology, are this year’s recipients of the prestigious Eleanor Main Graduate Mentor Awards. The recipients of the 2018 Eleanor Main Graduate Mentor Awards are Patricia Bauer, Asa Griggs Candler Professor of Psychology, and Osric Forrest 18G. Established by the Laney Graduate School in 2015 and awarded annually during Commencement celebrations, the awards recognize graduate faculty and graduate students who demonstrate mentorship excellence at Emory University. Forrest, a 2018 graduate of the Immunology and Molecular Pathogenesis doctoral program, credits his mentors for helping him unlock his potential. “I believe that great mentors have the ability to transform the trajectory of their mentees, which can remove boundaries and broaden horizons, especially for those students whose dreams have been limited by their personal circumstances," says Forrest. "Receiving this award is a testament to the great work of my many mentors who have inspired, motivated and supported my academic and personal development,” he notes. Bauer, this year’s faculty honoree, believes that providing students with a foundation of unwavering support is essential to mentorship. “Receiving this award tells me that my students feel they have a strong base of support upon which to build their own, independent scholarly and research careers. And because we learn to mentor by being mentored, it suggests that students perceive that they have a record of positive mentoring, lessons from which they can invoke as they mentor their own students,” she explains. These are lessons, Bauer says, she learned from her own mentors. Both Bauer and Forrest applaud the Laney Graduate School for celebrating individuals who model excellence through mentorship. Forrest agrees. “It is significant that the Laney Graduate School recognizes the important role that mentorship plays and has cemented this by recognizing exemplars of both student and faculty mentors using the Eleanor Main Mentor Awards,” he says. “I have personally benefited from the mentorship of some amazing faculty and administrators at Emory, and it is heartwarming to know that Laney also values their role in inspiring students during their time at Emory,” Forrest says. The mentor awards are named in honor of the late Eleanor C. Main, who joined the Emory faculty in 1969. During her time at Emory, Main served as chair of the Department of Political Science, director of the Division of Educational Studies, acting dean of Emory College, interim dean of the Laney Graduate School, associate dean of both the College and Laney Graduate School, and associate vice provost for graduate studies. She was also a recipient of the prestigious Thomas Jefferson Award, which honors Emory faculty or staff who have significantly enriched the intellectual and civic life of the Emory community. “Dr. Main was an outstanding mentor to both faculty and students during her time at Emory,” says Laney Dean Lisa Tedesco. “These awards honor her legacy and recognize those that have followed in her footsteps.